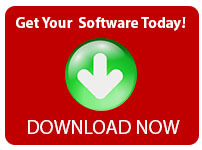 Design beautiful outdoor living spaces with the best landscape design software! Punch! 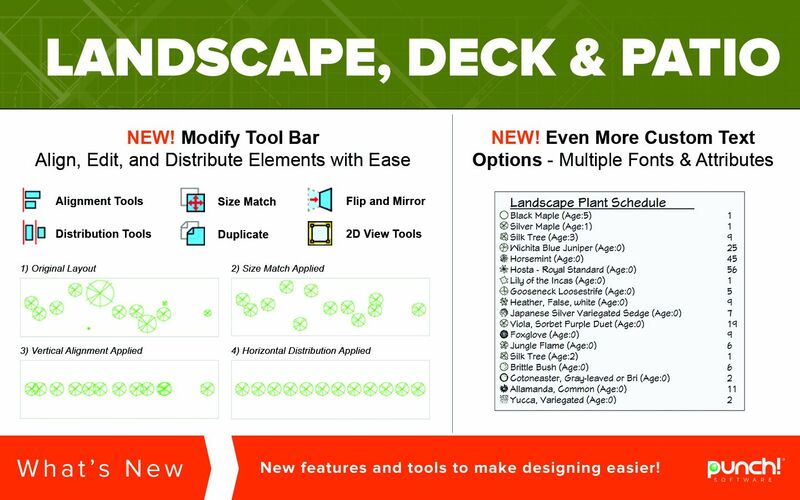 Landscape Deck & Patio Design version 20 provides a complete set of tools to plan, design, and visualise your outdoor spaces. Design your landscaping with drop in landscaping, or create your own with the extensive plant library. Punch Landscape Deck & Patio Design will help you choose the right plants for your area. Build the perfect deck from the ground up, or remodel and renovate your existing exterior spaces. Easily add pre-made outdoor kitchens, water features, custom fences, pathways and even a pool. Punch! 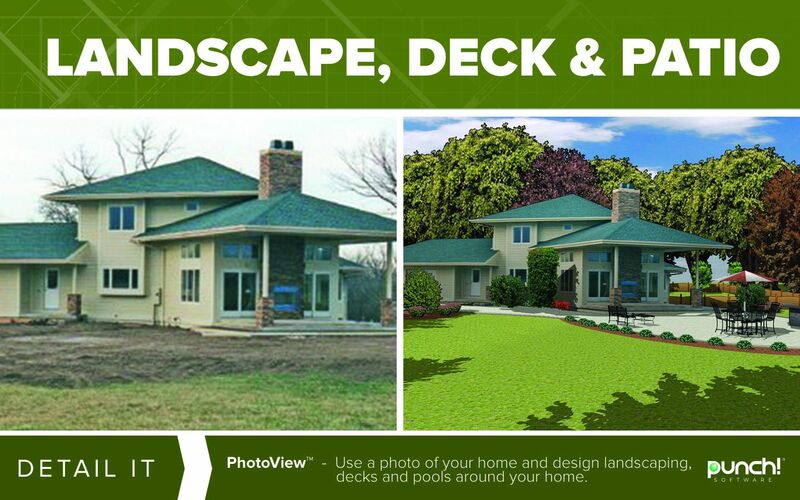 Landscape Deck & Patio makes designing and planning your landscape easier than ever before! PhotoView: Take pictures of the outside of an existing house and easily add design features and details. Site-planner automatically draws your property line, as you enter the coordinates, then exports your lot into your landscape design. Add real-world topography to your building site. Trace over your topo lines. Automatically cuts or adds fill and a building pad to your design. Includes a full selection of flowers, shrubs, and trees you can add to your design. You can also add your own favorite plants to the database! Drag and drop plants from a massive library that includes thousands of trees, shrubs and flowers. 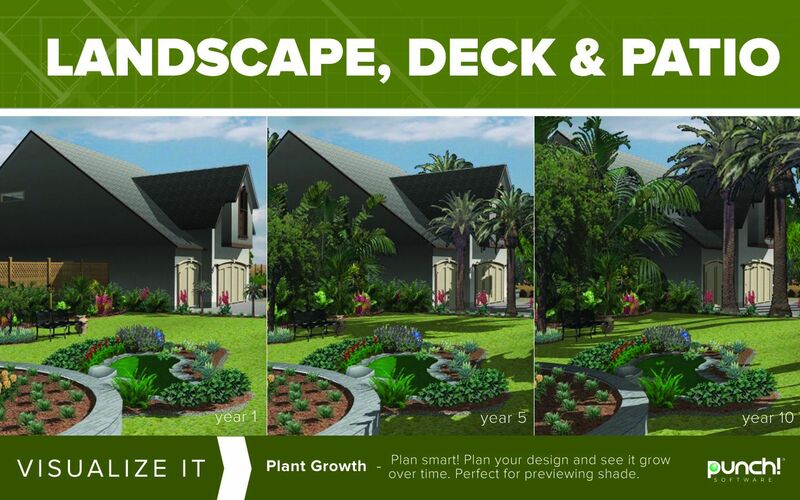 Use the Automatic Growth tool to see how your landscape will look in a few years. Personalise the topography with slopes and berms. 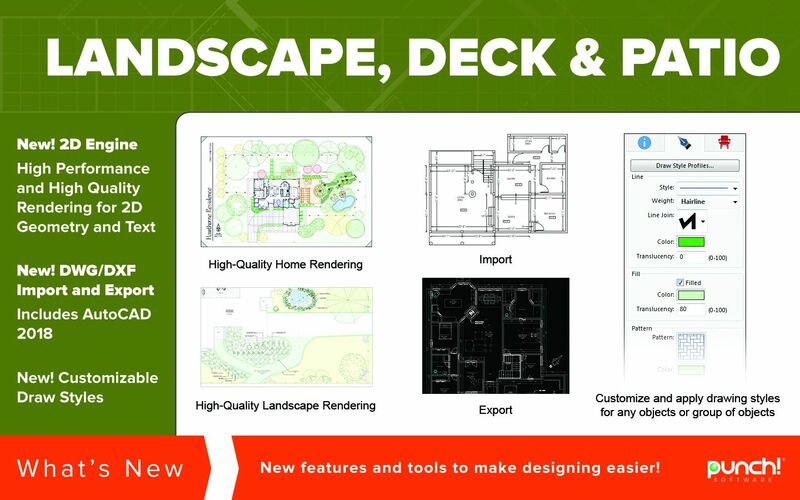 Add pre-made landscape gardens with a single mouse click. Design fences with custom material, colour, photos or even draw your own design. 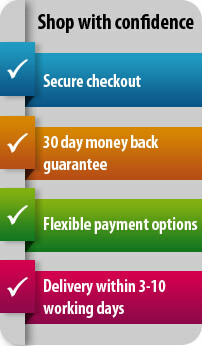 Draw from scratch, use and edit pre-drawn templates or let Pool Designer create your pool to your exact specs. Try a deck, pavers, pool/sap combo or other embellishments and see the result instantly as you draw. Zone specific plant groupings with simple drag & drop placement. A variety of shapes for freestanding, corners, and more.